Yesterday, I attended a JISC/UUK event at Woburn House entitled: “Research impact and operational efficiencies: The costs, benefits and implications for universities of open access to research outputs”. 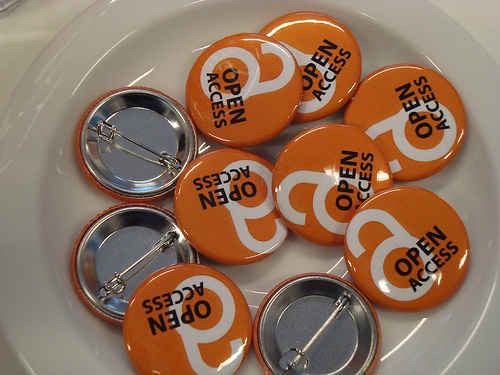 Evidence was presented on the business case for open access publishing and repositories. The Houghton Report last year identified significant sectoral savings of over £100 million plus benefits of up to £170 million possible from the adoption of Open Access – , but it was not clear of the implications for individual institutions. What is the balance of cost and benefit for research-led institutions? Does the size of an institution alter the projections? JISC recently commissioned Alma Swan, from Key Perspectives Ltd to develop an economic model to help universities calculate the costs and benefits of different modes of scholarly communication for their institutions. The case for open access was very effectively presented and, critically, the variety and content of the presentations ensured that the economic case was seen in the wider context. Efficiency is important but it’s not the only, or even overriding, driver for open access. The Chair, Paul Curran, Vice Chancellor at Bournemouth University opened the proceedings and was followed by Chris Hale, Policy Adviser, Universities UK. He outlined UUK’s commitment to Open Access and told us that they are currently reviewing their OA statement. Alma Swan then presented the results of the application of the above model to four sample HEIs. This was a clear and authoritative session which summarised the three OA models: (1) open access institutional repositories in parallel with subscription publishing, (2) open access institutional repositories in conjunction with overlay services (e.g. peer review, editing) and (3) open access journals. The economic costs and benefits for each institution were modelled. Significantly, (1) and (2) showed savings for all institutions whereas (3) involved costs for the more research intensive institutions. The model and the report are available from the JISC website. Paul Gemmill outlined developments at Research Councils UK and the activities they were involved in. They are looking at some principles for OA such as embargo periods and funding mechanisms rather than a general statement. Nicola Perrin, Senior Policy Adviser at the Wellcome Trust, gave an excellent overview of UKPMC. It was gratifying to see that their compliance rate is increasing. Ian Simpson, Pro Vice Chancellor (Research) at Stirling University provided a very interesting coal face view of implementing open access at his institution. He coined a really good sound bite for repositories: increase visibility – minimise effort! A panel discussion then offered an opportunity for question and comments from the floor. This was taken up with gusto and it was a shame there wasn’t more time for this. The morning concluded with an upbeat and entertaining presentation from Martin Hall, Vice Chancellor at Salford University who began by drawing on his experience of access to research outputs in Africa, placing the economic argument firmly in a wider moral context. He highlighted that the new digital world will inevitably drive changes in the business model for publishing – an adapt or wither scenario. An anecdote about the film industry admirably illustrated this. When videotape was first invented, Hollywood moguls were flummoxed as they couldn’t see how they could collect the ticket price from people in their own homes! A good story is worth its weight in gold. It was a very interesting event and hopefully some of the messages will be taken back to institutions. Following on from it, the Centre for Research Communications is organising five regional hands-on workshops which will give research managers and financial modellers the opportunity to try out the model with their own figures. Alma Swan will provide advice to participants.